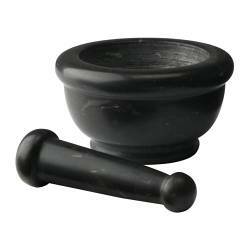 A few weeks ago, I bought a mortar & pestle from IKEA (I wished I had a $5000 shopping spree to that store). I got to use it for the first time tonight. I crushed some corianders seed, mixed in nutmeg, cinnamon, salt pepper, then rubbed it on sliced pork tenderloin. I cooked the the pork in a skillet, then sauteed some gala apples and shallots. Finally, I deglazed the pan with some apple cider and mixed in some chopped sage. It was really good and reminded that autumn is coming, even if it's still 90 degrees in Florida.